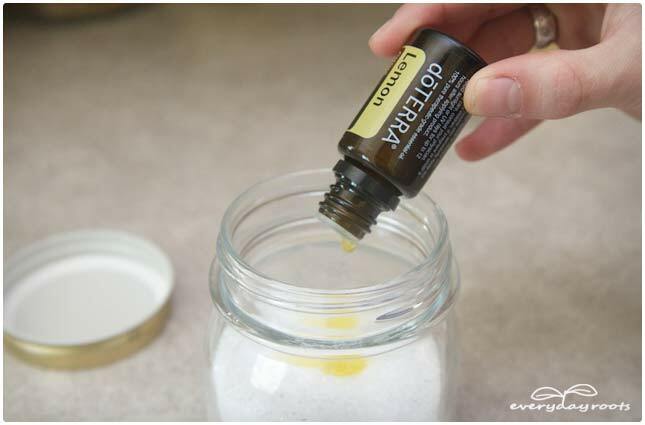 Easy to make, low-cost, and totally customizable, these “crystals” will leave your laundry soft and smelling lovely. The baking soda added in will naturally make whites whiter, and pull out even the toughest stains. Being an alkaline substance (opposite of acidic) it can neutralize the acid in stains that come from various cleaners, urine, or vomit. It is also environmentally friendly and perfect for people who have sensitive skin. To top it off, it won’t harm fragile fabrics, and it is a brilliant odor remover in the sense that it actually gets rid of smells…it doesn’t mask them with perfumey scents like other fabric softeners do. how about static? will this fabric softener help get rid of static cling? or do you know something that would? Put a tennis ball into the dryer with your clothing, it will reduce static cling AND soften clothes. 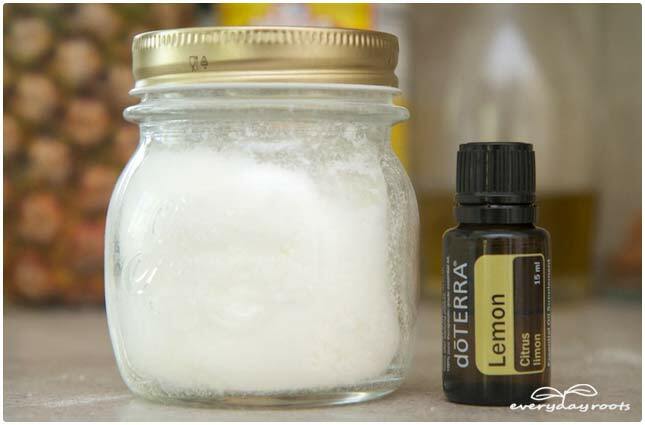 I use this softener; in addition, I use about 1/4 cup vinegar that has a few drops of essential oil added. I have found that this combination, along with my homemade detergent, has resulted in zero static. And that says alot, as I I live in a very dry climate with lots of static everywhere! This is the first combination that has resulted in no static, and I have been doing laundry for probably 30 years. I had read an article that said take 3 pieces of heavy duty aluminum foil about 12 to 14 inches long crumple up one into a ball. Then take the second piece and wrap/crumple it around the first one now do the same with the last one. Don’t worry about making it perfect and super tight. Now toss it in the dryer with your regular load. I didn’t think it would work but hey, I had foil so what the heck. I was shocked – no static!! My family have done at least 20 loads so far and that foil ball is still going! Don’t know why it works so well but it does. It gets a little smaller each time and smoother – my husband loves to check it after each load. Give it a try – it works – still haven’t had to change it out yet. Just so I get this right, you add it to the beginning with the regular laundry soap? Will it work with cold water? I’m very appreciative of this post. I’m going to try it out. Thanks. Aluminum foil balls reduce static. When they get worn apply another layer or so of more foil. I make mine initially about tennis ball size. I use four. So how could/would this work with a front loading machine? I can’t “toss in” during the rinse cycle. The only bad thing about this for me is that my washer is in the garage, and short of standing right there ALL the time, I have NO way of knowing when my rinse cycle starts. I just add it at the beginning, along with my detergent; works great! Alrightly well I botched the wording on this one. You can put it in at the start, when put your clothes in the machine. You don’t have to catch it during the rinse cycle. Sorry folks! What about HE washers, will it work then? Can I add it to the compartment for fabric softner? I have an HE washer and both the Epsom salts and baking soda stated HE user friendly. I added one heaping tbsp into the fabric softener tray, turned on the washer and walked away . I made jars of this for my grown children today too! How much per load? Thankyou for sharing with us. Depending on the size of the load I use 3-7 tablespoons. Enjoy! Just to clarify…for a front loader HE washing machine, we can add this preparation to the fabric softener compartment? Or do we put this in the detergent compartment? It would be nice to not have to use commercial fabric softener. We have terrible static due to our arid climate here. you can add warm water with the softer to help wash it down !!!!! Have a God Blessed day!!!!! I would think it would be fine tossed in with the clothes. The ‘laundry enhancer’ crystals such as Purex go in an HE front loader tub prior to the clothes and they are essentially Epsom salts, coloring and fragrance. I have read other blogs where comments have been made that the Epsom salts can leave a film of sorts on clothes. I haven’t used them yet myself (still using up store bought products) so I can’t really say how accurate this is. It’s just something of which you should be aware. what if I don’t use a dryer and I use an open area outside to dry our clothes, will it work the same? i’d have to wonder if this would be safe for septic tanks. i started making my own cold processed soap and then use it to make homemade laundry soap, at first i used white vinegar in my downy ball to get the soap residue completely out and it helped with static if they were dried in the dryer as well but heard that vinegar isn’t great to use in septic systems.. So instead i just use the homemade laundry soap in the washer and toss in 3 of my wool dryer balls that i made and felted..it works great for the static, very noticeable difference when i forget to toss them in as i did last night..LOL you can find recipe’s online for homemade laundry soap (very cheap to use ) and for the wool felted balls.. I don’t know if anyone will actually see this now…but there’s no reason this would damage your septic tank. Only baking soda or acids like vinegar in very, very large quantities can damage your septic, and you couldn’t possibly do enough laundry to elicit an emergency. It’s better for your septic to use natural products because it allows the septic to work as its own self-regulator. Thank you for this homemade laundry softner recipe. I already know it’s a $ saver. I’m just getting started with this do-it-yourself style of living. I’ve made smoothies, gluten-free crust pizza, gluten free cake, home-made taboulleh but need to branch out to other household areas. And with your easy-to-follow recipes gives me great encouragement. 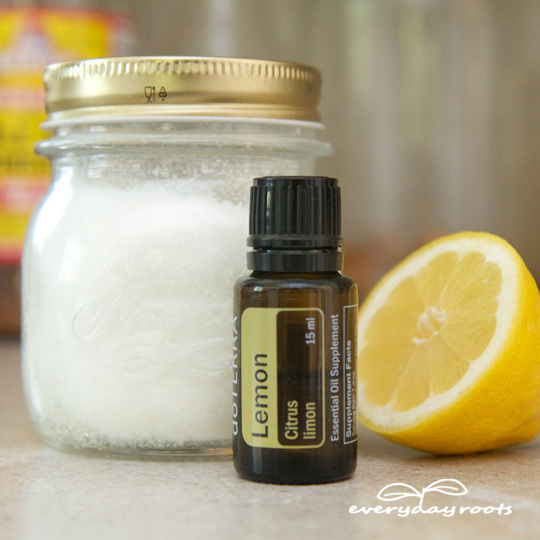 thanks for this recipe….needed a softerner along with my homemade laundry soap…. I started using fresh ginger in my cooking!!! I was very afraid it would taste yucky but was very surprised it was very good!!! I use cold water for most of my laundry. Will the salts dissolve in cold water? thanx so much for the info! i’m wondering how epsom salts would be for plants? my washing machine is plumbed to save the grey water! I didn’t see the answer to Janet’s question about this being safe for septic systems? thank you so very much for your reciepes can i please start getting your email updates and new ideas? 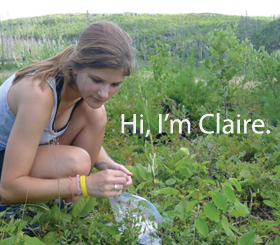 Where do you find essential oils?? Thanks for this recipe. Could you use fresh lemon juice instead of essential oil? Now if you can tell me how to stop leaves on my plant from turning yellowand getting black spots before they die. I’m horrible at math – can someone help me? I would like to put dilued Epsom salt in my machines fabric softener holder (in middle of the agitator. Putting salt crystals with water didn’t dilute however, I blended the crystals in water and that can be held in the holder til rinse cycle. Now…for you math brains. In a mason jar how much Epsom salt per water rachio do I need per load in my dispenser? Just made some and can’t wait to try it! Wondering what the reasons are for using salt. Is it to hold the scent or does it also help soften clothes or any other reasons? Ok…I made this last night. 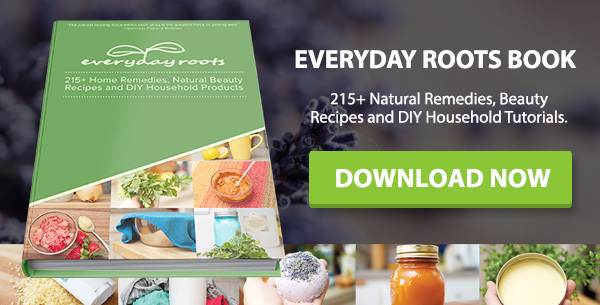 I used it in a load of towels and they didn’t seem any softer, and there was MAYBE a light scent of the essential oil…I even put two tablespoons in at the beginning and two at rinse because I couldn’t smell anything at the rinse. Also when I made this, it was a lot more than you have shown above in your pics, it is over half (maybe 3/4) of a large mason jar Help please??? I made it just today. In my first load I put it in the fabric softener compartment with a bit of vinegar to make it more liquid but it didn’t all go out into the water as there was some left behind. So in the next load I just put it in on the clothes to go through the wash part of the cycle. I had to get out of the mind set I’ve been in with it being something to smell in the end and look at it as softening the clothes in general and not so much after smell. No my clothes don’t smell a lot like my scent I created but the clothes came out of the dryer smelling fresh and clean and NO static cling! I also made a double batch. The reason your clothes weren’t any softer is because Epsom salt actually hardens your water instead of softening It. Epsom salt is magnesium sulfate. Rock salt or kosher salt is what you want to use. There is alot of misinformed people out there. That’s what I was wondering Tanya, Epsom Salt is Magnesium (and not actual salt) which is one of the elements that make water hard, cling on clothes, making them stiff. However, sea salt is the mineral else called sodium chloride, very different to magnesium (although sea salt contains a bit of magnesium also). So, I was surprised it was either/or. Vinegar does not harm septic systems. According to the information I found, it is actually beneficial. I have been using 2-3 TBL of just epsom salts or epsom salts with EO added. I add it with my detergent at the start of the cycle. I use this recipe but also with white vinegar in my front load. My question is when I mix the dry ingredients with the vinegar it fizzes. I stir till it stops then add it to my softener tray. Does this reduce the effectiveness of the baking soda and salt? quick question…….can I put this in a sachet and put it in my dryer? is this safe on colours ??!! Thank you!! This works!! I put the mixture in my fab softener compartment and add vinegar. So far I have not had any problems with static. I am wondering if you could go ahead and add the vinegar to the above recipe and use it that way. Thoughts? First off, I LOVE this recipe and have been using it for several months. However, I just read an article online that says because of the minerals in Epsom Salt (and I LOVE Epsom Salt) it is not good to use in cleaning recipes because it makes your water hard. Any thoughts on this? I am going switch to ice cream salt for now, but thought I would share this with you to see what you think? Thanks again for such a great recipe! Salt is salt – in whatever form and salt is the main ingredient in water softners. Unfortunately there are many mis-informations to be found on the internet. According to the experts it would take an enormous amount to cause a problem – like 500 lbs. worth. So don’t worry if you use epsom salts in your bath, as a soaking solution, etc. Your system will not be damaged from the “salts”. To clarify… epsom salts is not really salt; it is a pure mineral compound of magnesium and sulfate. 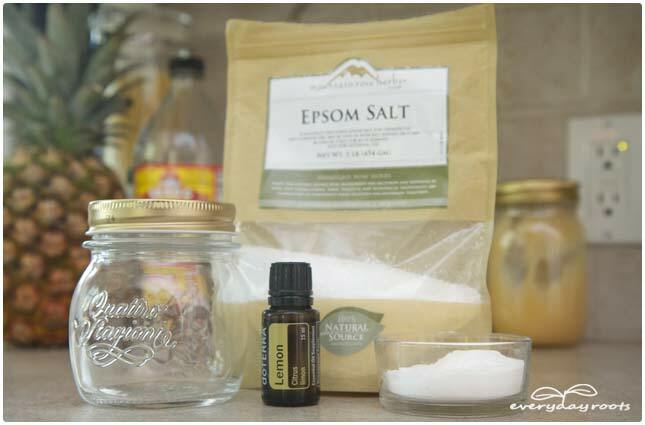 For those of you worried about using Epsom salt, this recipe pretty much works with any type of salt! I use kosher salt, and have been making it for years, and it comes out great! Can find lots of fun essential oil blends out there as well (I sometimes even make pumpkin pie fabric softener). It’s a very customizable way to soften your clothing, and also salt can really aid in helping remove stains, and keeping colors from bleeding! 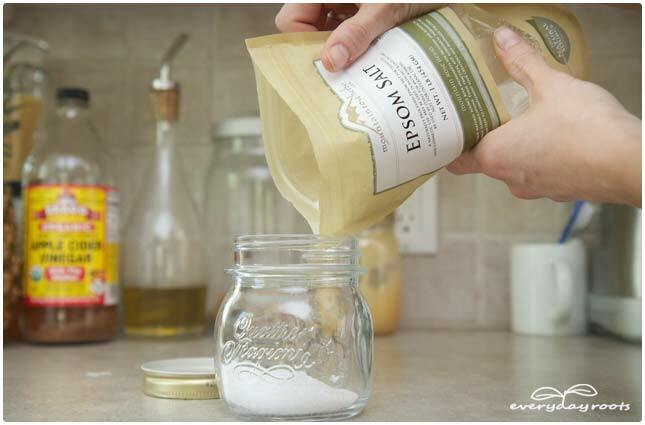 Kosher salt will work well, Epsom salt hardens water which makes the laundry detergent not work a well. So all salt will not work. I have very hard water and hang my clothes outside and i’m trying to find a cheaper more natural solution without buying store softeners that don’t even work well. tired of stiff clothes . I just want to soften my clothes. I don’t care about static or smell. How can I just soften them? 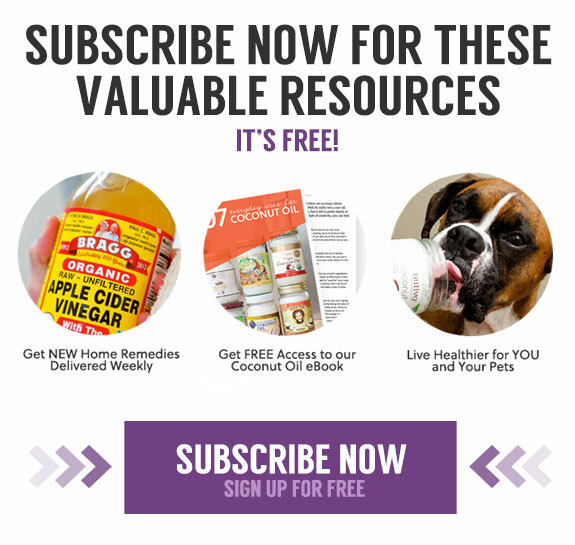 Which Epsom salt brand is best? I’ve heard claims that come can have metals in them such as lead. thanks! 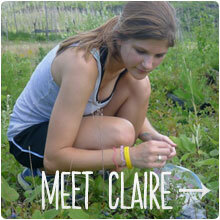 Claire, your recipe says you can add the baking soda separately and, if doing so, mix in 1/2 Cup per load. 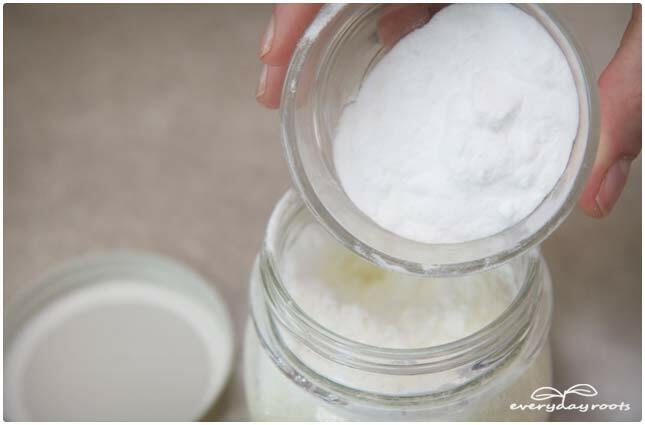 The entire recipe calls for 1/2 cup baking soda and then you suggest adding a few tablespoons of the softener mixture. Is this a typo? If not, why so much baking soda if adding separately? Thank you for the recipe – just want to know I’m doing it correctly. Oops, thanks for catching this Becky! That is definitely a typo…if you’re adding the baking soda separately just add in the same amount as the Epsom salt/essential oil mixture (2-3 tablespoons or so.) It won’t hurt to add 1/2 cup of baking soda, but it’s not necessary. I’ll get this corrected ASAP! Hi just noticed that the directions still call for a 1/2 cup of baking soda…you are saying that only 2 – 3 T. is needed in this recipe, am I correct? For people worried about their septic systems, once a month put 1/2 cup brown sugar with 3 tbles yeast in the toilet and flush. Will keep your septic active says septic pumpers. We have done this for years. 25 years before having it pumped! 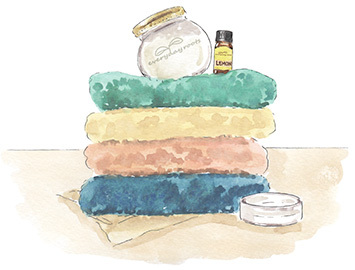 To make nice scent in clothes in dryer I put 4 or 5 drops essential oil on a peice of cloth and throw it in . Hello there,thank you for this amazing recipe. My grandson thanks you as well he is allergic to most every laundry product out there so I make my own laundry soap,but haven’t found a compatible smelly for his clothes but now I have,just wanted to suggest reusing an unstoppable container as I did. Works great for it has the perfect spout and the lid works as the measuring cup,2 in one for me. We thank you! !